If balsamic vinegar people have already got used, and at least not be surprised to find the bottle of dark liquid on the shelf, balsamic cream causes still a lot of questions. The most hidden, what is it for and in what dishes it is best to add. Balsamic cream represents a dense liquid of dark, reddish-brown shade with a slight smell of vinegar and berries. It tastes acidic, but not so pronounced as in balsamic vinegar. It is necessary to distinguish the original cream from possible forgery, which, though it will cost a lot cheaper but from the original in it, except the name, nothing is. This balsamic cream is made from a mixture of balsamic vinegar with grape must with the addition of a small amount of lemon juice and sometimes a modified starch. Why in the cream should not be exact, so is sugar. The necessary sweetness quality sauce will give the grapes, and the more he doesn't care. Of course, the balsamic cream is a fairly unusual product, and someone who is just discovering the Italian cuisine might seem like an unusual, maybe too saturated. But then, as they say, you only get a taste. 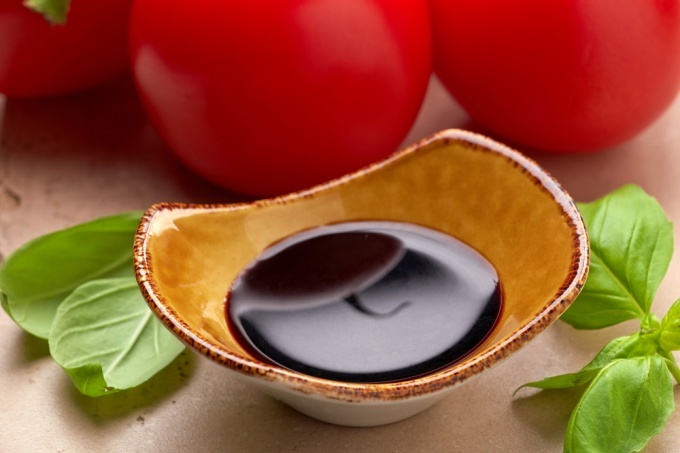 If balsamic vinegar is used mainly as an additive to salad sauce, the cream can be used almost anywhere. First and foremost, how strange it may sound, for decoration of desserts. For example, ice cream with berries. This will only need to put 2-3 ball any ice cream: vanilla, chocolate, fruit, next to placed a few raspberries, a few slices of peach or pear and lightly sprinkle with balsamic cream. Moreover, it is slightly, just a few drops or draw a few thin lines, quickly swiping back and forth over the dish with a bottle of cream. But you can just cut thin slices of juicy figs and sweet strawberries and season them with Crema di Balsamico. Balsamic cream can be used for the preparation of pickles of various kinds. Meat, fish, seafood and even soy product tofu is becoming an unusual taste if before cooking lightly-marinated in a mixture of herbs with the addition of cream of balsamic. Also, this cream goes well with cheese. Simply add it to the Parmesan, soft goat cheese or with blue cheese, and a cheese platter will not only gain new colors, but will sparkle with new taste. Crema di Balsamico can give an unusual note for the usual sauces and additives to various dishes. Just a couple of drops capable enough to transform the usual sour cream, cream, cream cheese or soy sauce, that without them, any dish will start to seem bland and boring. The net balsamic cream is often used for the formation of the caramel glaze on the baked meat: duck breast, rack of lamb or saddle of venison. Just enough to lubricate the raw cake mix before you send it in the oven and the cream will not only contribute to the formation of crust, but also adds an unusual, almost fairy-tale flavor. Well, the one who so loved the Crema di Balsamico, which is ready to add it in every dish, there's no need to dissuade themselves from this activity. It is because balsamic cream goes with everything: soup, meat, and fish, various side dishes and casseroles, and, of course, to the dessert. So versatile is the product.